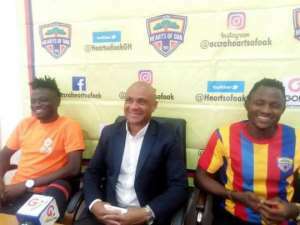 Kim Grant has said the delay in the start of the Ghana Football Association (GFA) Normalisation Committee Special Cup, has been a blessing in disguise for Hearts of Oak. The Phobians will play their first game at home against fellow Premier League side Dreams FC at the Accra Sports Stadium on Sunday, March 31 at 18:00 GMT. Speaking in the pre-match conference ahead of the match, the former Ghanaian international who doubles as the Director of Football of the club said, the delay in the resumption of football, had afforded him sometime for his players to absorb his philosophy. Grant who was appointed three months ago said, building a new team needed time and he was fortunate, as the delay had helped him a lot. He said, his main focus was to build a team for the future and he needed a good foundation to start such a project. "It was positive for me because it gave me more time to develop the team and put in place my strategies and philosophies on how we want to play. “The players have worked so hard and I'm really delighted that we are going to kick-off on Sunday," he said. The former Ghana international, however, pleaded with the ever-faithful fans to manage their expectations from the players. He said his team was a young team averaging 20 years and therefore needed more encouragement than harsh treatment. "I will plead with the supporters to be patient with them (players) and they would need 100 per cent support from them even when things don't go well because they are young lads." He said he was hopeful the fine form of his team during the pre-season would continue, adding that, the fans would enjoy his team's play. Grant noted that he joined the Phobian family to win titles and the Special Cup would not be an exception. He said their aim in the competition was to win and play in the CAF Champions League next season.